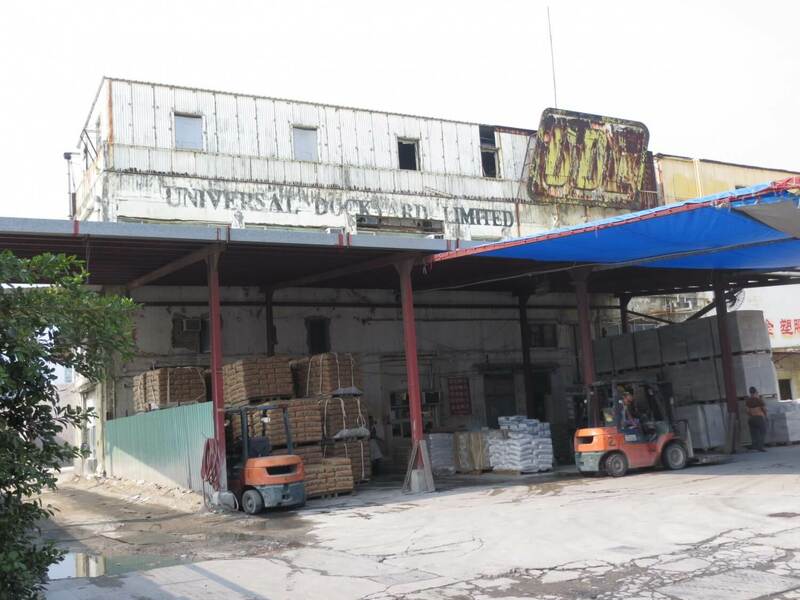 HF: Universal Dockyard Ltd is situated at 44 Ko Fai Road which is the extreme NW corner of the Yau Tong reclamation. I have found out almost nothing about the company. Judging by these photos I took on 25th September 2014 it is no longer functioning at least at this address, though it is the only I have found. Having looked at a couple of maps I now see that to the immediate East of the building shown is an oblong shaped marine area divided into about four areas each about 80 metres long running from the shoreline almost up to Ko Fai Road. These seem to be slipways. 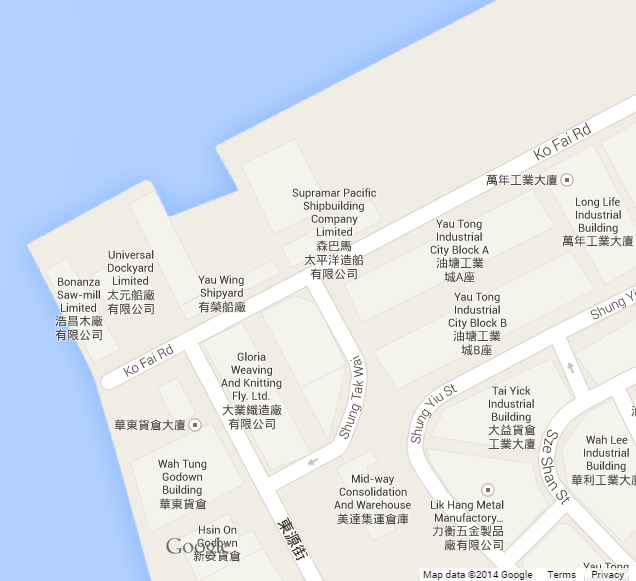 However a) they were hidden behind a fence along the Road and I think also between them and the company building and b) I think they have been those of the Yau Wing Shipyard whose main building runs parallel to Ko Fai Road on the google map shown below. 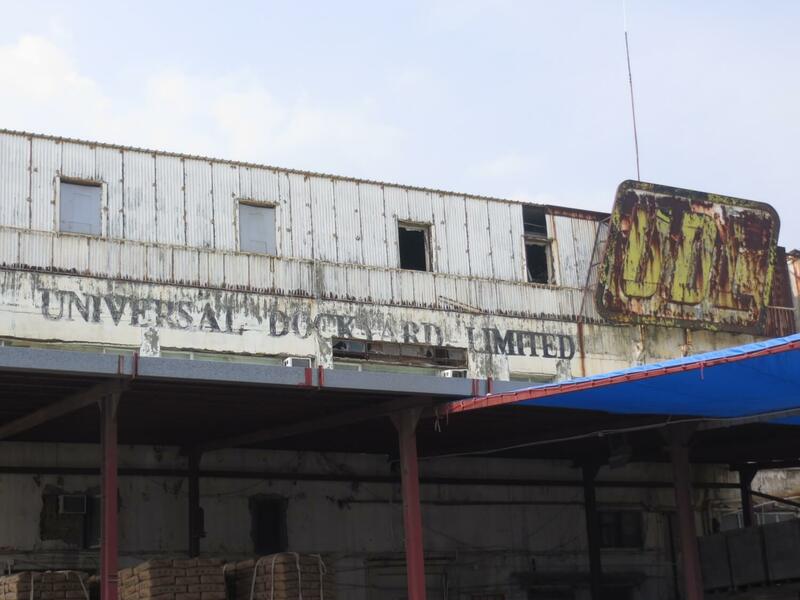 The Dockyards is supposed to have been involved both as shipyard and ship repairs. 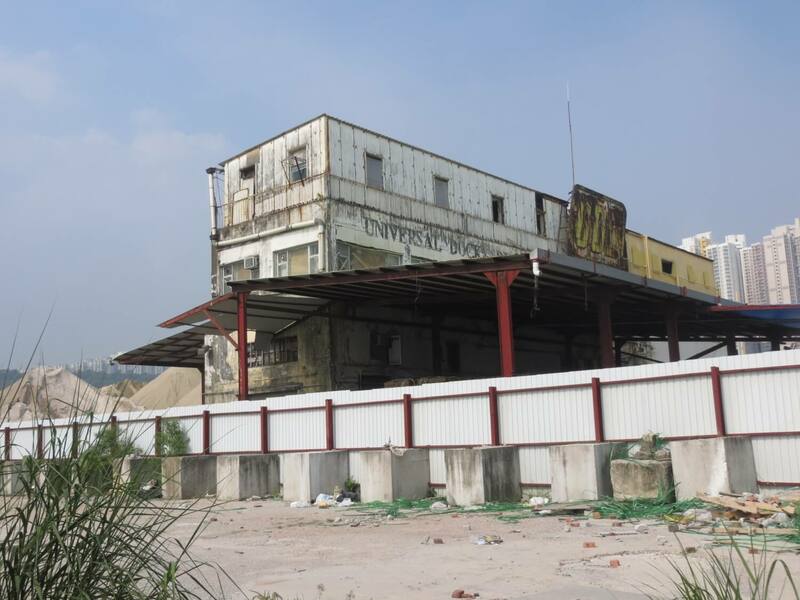 The ‘slipways’ on the two maps I looked at extend right up to the Yau Wing Shipyard building running along Ko Fai Road. 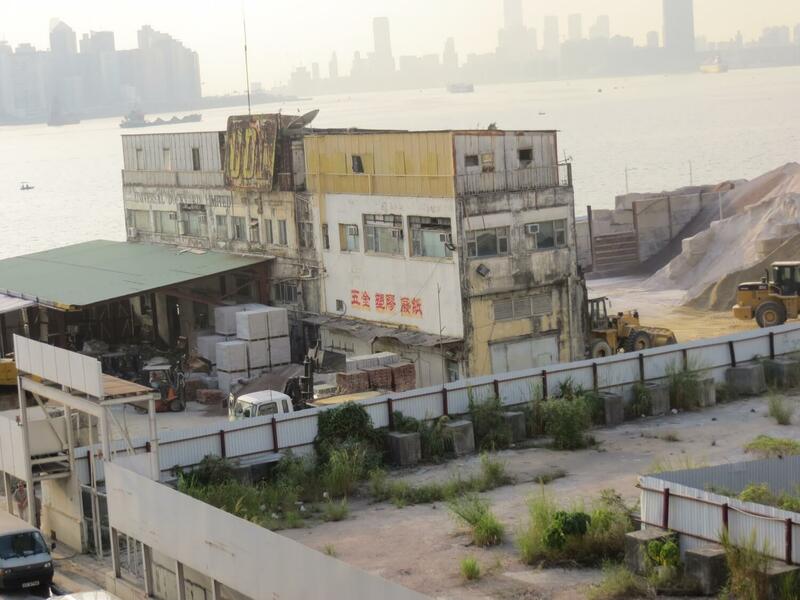 The first photo was taken on 25th November 2014 from the 3/F of the Union Industrial Building, 27 /Ko Fai Road. This article was first posted on 17th November 2014. 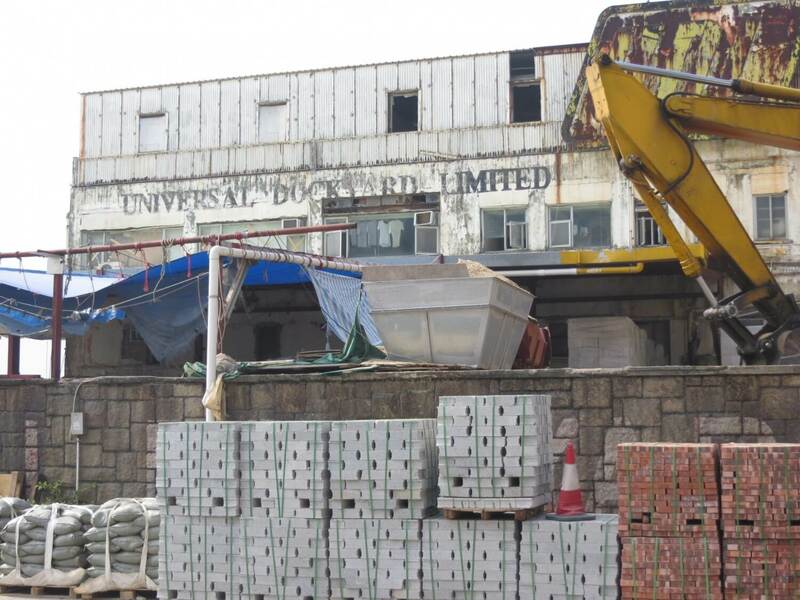 The founder of Universal Dockyards (now within the UDL Group) was Mr Leung Man Kwong (梁文廣, b. unknown-d.1966), who I’ve been trying to track down for ages and have at last managed to via this website. What matters here is that Mr Leung was the boss of 80 divers, shipwrights, blacksmiths and other salvage workers, who were on hand in late 1945/early 1946 (they’d been working in Guangzhou on a destroyed bridge as I recall) and ready to roll when Capt W.A. Doust RN arrived in HK charged with beginning the clearance of HK waters of the c.230 wrecks, etc. The result of the cooperation between Capt Doust and Mr Leung, especially once Capt Doust had retired from the RN in early 1946 and become the salvage adviser to the HK Government, was that HK harbour was cleared and back in full commercial operation quicker than any harbour of comparable size and complexity that had to be restored during and after WW2. After the initial RN clearance, we ended with the ending of the military administration in spring 1946, the RN and the newly christened Marine Department split responsibilities, with the 40% of the harbour covered by the naval anchorages being the responsibility of the RN and the 60% of the commercial harbour that of Mardep.